Welcome to my animal crafts for kids section where you'll find easy and inexpensive animal crafts for kids that kids will enjoy. Cover all around the outside(except bottom) of a styrofoam cup with glue. Spread apart 4 cotton balls and glue them around the styrofoam cup. Draw a cat's face with whiskers onto the bottom of the cup with markers. Cut out two small triangles from the scraps of construction paper and glue to the edge of the bottom of the cup for the cat's ears. With a sharp pencil, punch a hole near the bottom and side of the cat's face. Thread the ribbon through the hole for the cat's leash and tape one end of the ribbon to the inside of the cup. Paint all around the outside of the terra cotta pot, including the inside rim. Let dry. Cut out a circle from the pink felt for the pig's snout and draw two black lines with the marker in the center of the circle for nostrils. Cut out two large pink triangle shapes from the pink felt for the pig's ears. Glue the bottom edge of the pig's ears to the inside rim of the pot. Glue on the wiggly eyes and the pig's snout. Twist a pipe cleaner a few times for a curly tail and glue onto the back of the pot. These pig pots are really cute! With the paper lunch bag closed and lying flat, the bottom of the bag will be the dog's face. Glue on the wiggly eyes to the bottom part of the bag. For the dog's muzzle, cut out a half circle from the white paper to fit the width of the bag and glue to the bottom edge of the bag. Cut out another smaller half circle to fit, and glue below the muzzle. Draw and color in the dog's tongue on this half circle. Glue on the pink pom pom to the top and middle part of the dog's muzzle. Cut out two large oval shapes from the sheet of colored foam or colored paper and glue to the bottom edge of the bag for the dog's ears. Draw a leash below the dog's mouth. 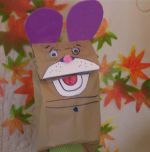 Click here to see more easy animal craft ideas for kids.